Our Odd Future survival stories and other crazy adventures had at Pitchfork Music Festival 2011. 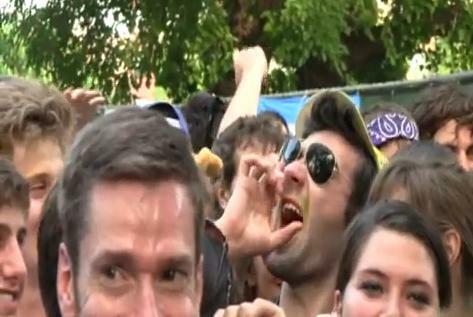 An interview with Gideon, a curious concert fan who tells us why he did a hilarious Harry Potter shout-out experiment (check out the video) at Pitchfork 2011 and how The Flaming Lips rocked his world in Tennessee. An interview with our friend Tyler who explains the details of his intriguing Pitchfork fashion experiment with photographer Jason Stoff, and why he believes eating half-pound heavy metal gourmet Mastodon hamburgers at Kuma’s Corner in Chicago and experiencing epic Nine Inch Nails and Metallica concerts are necessary rites of passage. And as always, this show was recorded with the awesome Blue Microphone USB Snowflake and the portable Mikey. Rate, comment and subscribe via iTunes. Are These Concert Fan Coalition Sites for Real? Were you at the Pitchfork Music festival? Have you been to Kuma’s Corner? Did we saying something to rile you up? We invite you to share your concert experiences in the comments below, so they can be included in a future episode of Live Fix Radio.